add the flour and the sugar and the yeast in the mixer bowl. add 2 cups water and start kneading on slow. knead faster and add more water as needed. incorporate the oil and sprinkle the salt on the dough while the mixer is on. knead for five more minutes. let the dough rest and proof. Rinse the onion to get out the bitterness. Sweat the drained onion in the oil. Mince the tomato, the pepper, and the parsley. Add the onion with the oil to the tomato mix. Mix in the ground beef with the spices and the condiments. Let them rest covered with a towel. Roll the dough into thin disks periodically dusting the table and the dough with flour. Spread the topping mixture on each disk. Bake in a hot oven until dough is crisp, and the beef is cooked well. 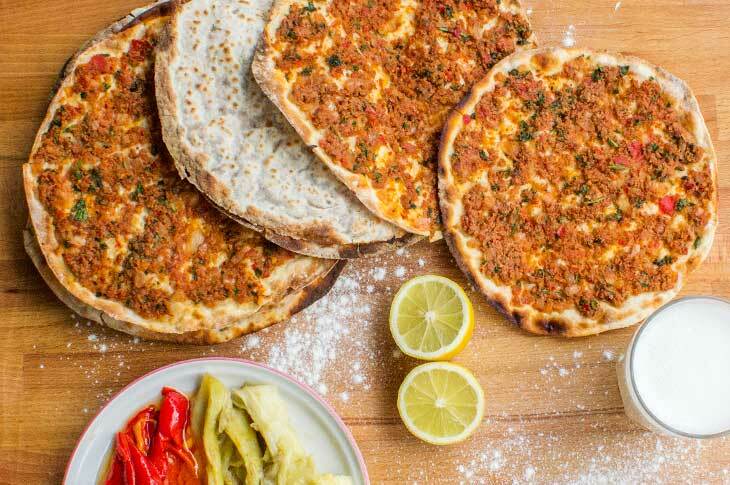 We enjoy our Lahmajun with a glass of cold "Tun" (Ayran). We squeeze fresh lemon on top and wrap the lahmajun like a sandwich. The table isn't complete without some of the optional toppings we prefer in our lamhajun wrap. Some of the topping options are: roasted eggplants, roasted red peppers preserved in extra virgin olive oil, rocket leaves, fresh mint.